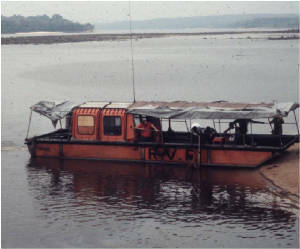 We used the funny looking orange boat to map the Kasai River, a tributary of the Congo River. Before we got there in 1987 it took them 90 days to map small stretches of river using sextants and lead lines. We turned the maps around in a couple of days. 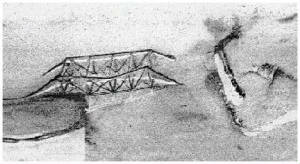 The Warren Truss Bridge, on the right, was imaged in 15 meters of water by Pete and John while we were mapping the relicts of the river side villages submerged when Wachusett Reservoir was built in 1904 to quench Boston's thirst. 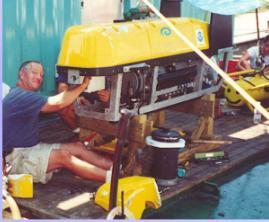 In the center you see me repairing "Echo" which got spanked by the boat during our program mapping the existence of beaches hypothesized to exist at 130m prior to the onset of Noah's flood/deluge when the Bosphorous Straights were overtopped by the Med waters.